Check out a great family camping website called Beyond The Tent.com. The owner of the site, Ryan Cunningham, his wife and family live in Robbinsdale, MN. Ryan began the web-site back in April of 2013 and has seen his traffic increase after being featured on several local news programs. Ryan uses the web-site as an opportunity to test gear while taking many family excursions (sounds like fun/not a job). He also runs several other blogs such as Studio Wars.com and Home Brewing Blog.com. Ryan’s crew recently tested our Cargo Saddlebag on a recent family trip. It is bad for the reviewer, but good for Rightline Gear when it rains on the trip. 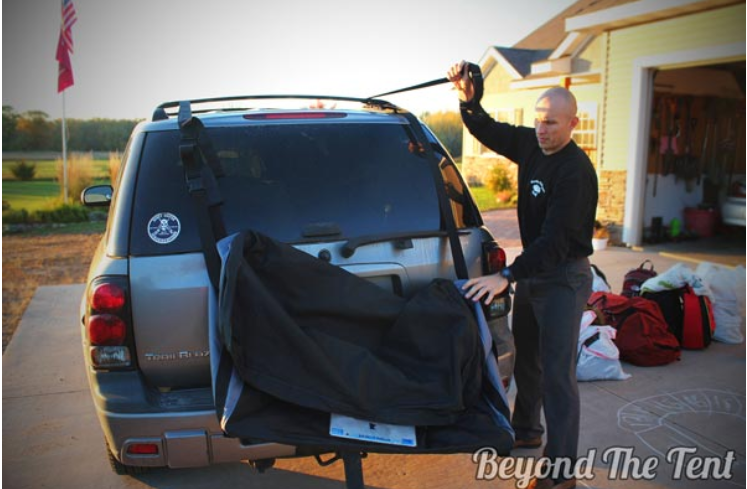 See what Jeremy has to say about the only car back cargo bag on the market: http://www.beyondthetent.com/family-travels-rightline-cargo-bags/. Feel free to contact them to get first hand insight on using our product. This entry was posted in Product Reviews and tagged Cargo Saddlebag. Bookmark the permalink.